Genetic testing enables you to compare your genes with other families and ethnic groups. The database includes not only Estonians but also Finns, Latvians, Lithuanians, Russians, and most other peoples of Europe. The Estonians (eestlased) live in Estonia (Eesti), a small country bordering the Baltic Sea in northeastern Europe north of Latvia, west of Russia, and south of Finland (but not connected by land to Finland). The Estonian language is a Finnic language related to the Finnish spoken in Finland and also to the Karelian language of northwestern Russia (in land that was part of Finland until 1940). Estonian is more distantly related to the Ugric languages like Hungarian. Estonian has multiple northern and southern dialects. The most common Y-DNA (paternal) haplogroup among Estonian men is N, found among 34 percent of those tested, followed by R1a, found in about 32 percent. I1 is found in 15%, R1b in 8%, T in 3.5%, I2* and/or I2a in 3%, E1b1b in 2.5%, J2 in 1%, I2b in 0.5%, and Q in 0.5%. The most common mtDNA (maternal) haplogroup among Estonians is H, found among 43.5 percent of those tested, of which 19% belong to H1+H3. The next most frequent mtDNA haplogroup is U, found among 24.5% of whom about 16% belong to U5, about 7% to U4, about 1% to U2, and about zero percent to U3. J is found in about 10%, T in 8%, V in 4%, K in 2.5%, W in 2.5%, I in 1%, and X2 in 1%, while 3% belong to one or more other haplogroup(s). Blue eyes are prevalent among Estonians, but multiple observational surveys indicate that large proportions of them have grey eyes or brown eyes, and small proportions even have green eyes or hazel eyes. The Estonian physical anthropologist Juhan Aul, who eventually became a professor at University of Tartu, evaluated 17,700 Estonians in the 1920s-1930s and found that 24% had pure blue eyes and 64% had blue-grey eyes; the remaining 12% had darker eye colors. The Estonian Silver M. has also been observant of eye color and told me in 2015: "i have 1000 Estonian friends, I'd say at least 250 of them have brown eyes, and like 1/3 have grey eyes, 1/3 have blue eyes, 1% perhaps have green eyes." Aul found the frequency of blond hair among Estonians to be 71.8%. A minority have dark hair - sometimes black. On average, Estonians have 49.5% of West European Hunter-Gatherer (WHG) ancestry, the highest percentage of any living population. Apparently they are only bested in this regard by one Saami person who was tested to have 51% of this ancestry. Of related interest: Virpi Laitinen, Päivi Lahermo, Pertti Sistonen, and Marja-Liisa Savontaus. "Y-chromosomal diversity suggests that Baltic males share common Finno-Ugric speaking forefathers." Human Heredity 53 (2002): pages 68-78. The Latvians and Lithuanians were found to be closely related to the Estonians in relation to paternal (Y-DNA) ancestry. Fulvio Cruciani, Roberta La Fratta, Beniamino Trombetta, Piero Santolamazza, Daniele Sellitto, Eliane Beraud Colomb, Jean-Michel Dugoujon, Federica Crivellaro, Tamara Benincasa, Roberto Pascone, Pedro Moral, Elizabeth Watson, Bela Melegh, Guido Barbujani, Silvia Fuselli, Giuseppe Vona, Boris Zagradisnik, Guenter Assum, Radim Brdicka, Andrey I. Kozlov, Georgi D. Efremov, Alfredo Coppa, Andrea Novelletto, and Rosaria Scozzari. "Tracing Past Human Male Movements in Northern/Eastern Africa and Western Eurasia: New Clues from Y-Chromosomal Haplogroups E-M78 and J-M12." Molecular Biology and Evolution 24(6) (June 2007): pages 1300-1311. First published online on March 10, 2007. This large study of populations from Europe, Asia, and Africa confirmed that all signs point to the Y-DNA haplogroup E-M78 (E1b1b1a1) having come from northeastern Africa originally. This African lineage did make its way north to Estonia. "Table 1: Frequencies (%) of the Y-chromosome E-M78 sub-haplogroups in the 81 populations analyzed" tells us that of 74 Estonian males who were sampled, 4.05% (3 of them) were in E-M78 while 4.05% were in E-V13. "The haplotype variation in Estonia suggests an admixture of Baltic and Finno-Ugric haplotypes." Anne-Mai Ilumäe, Maere Reidla, Marina Chukhryaeva, Mari Järve, Helen Post, Monika Karmin, Lauri Saag, Anastasiya Agdzhoyan, Alena Kushniarevich, Sergey Litvinov, Natalya Ekomasova, Kristiina Tambets, Ene Metspalu, Rita Khusainova, Bayazit Yunusbayev, Elza K. Khusnutdinova, Ludmila P. Osipova, Sardana Fedorova, Olga Utevska, Sergey Koshel, Elena Balanovska, Doron M. Behar, Oleg Balanovsky, Toomas Kivisild, Peter A. Underhill, Richard Villems, and Siiri Rootsi. "Human Y Chromosome Haplogroup N: A Non-trivial Time-Resolved Phylogeography that Cuts across Language Families." American Society of Human Genetics 99:1 (July 7, 2016): pages 163-173. 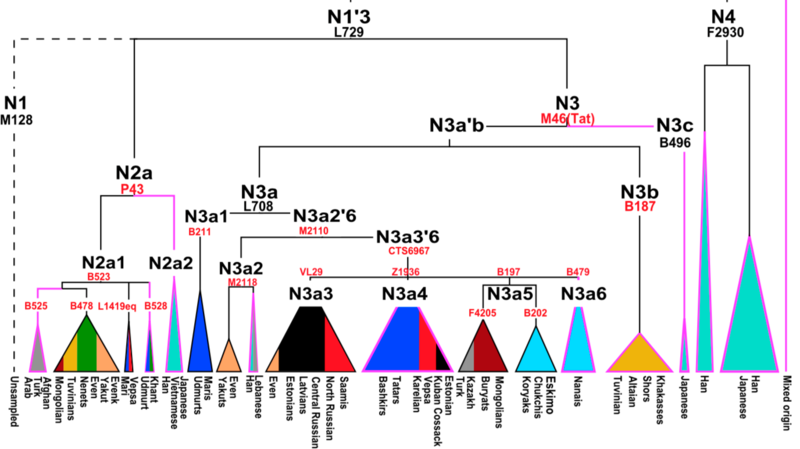 Y-DNA haplogroups within the N family that Estonians sometimes belong to are N3a3 and N3a4. Toomas Haller, Liis Leitsalu, Krista Fischer, Marja-Liisa Nuotio, Tõnu Esko, Dorothea Irene Boomsma, Kirsten Ohm Kyvik, Tim D. Spector, Markus Perola, and Andres Metspalu. "MixFit: Methodology for Computing Ancestry-Related Genetic Scores at the Individual Level and Its Application to the Estonian and Finnish Population Studies." PLoS ONE 12:1 (January 20, 2017): e0170325. This evaluates autosomal DNA SNPs. Figure 1 shows regional variation of the proportions of Estonian, Latvian, South Finnish, North Finnish, Russian, and Swedish ancestral components within Estonia.